In the Port-au-Prince suburb of Petionville, some 2,500 people subsist in a crowded public park near open ditches flowing with human waste, a grim scene frozen in time two years after Haiti's earthquake disaster. Less than half the $4.59 billion pledged had been received and disbursed when the UN last published its figures in September, and the coffers of the aid agencies that run Haiti like a de facto NGO state are also drying up. 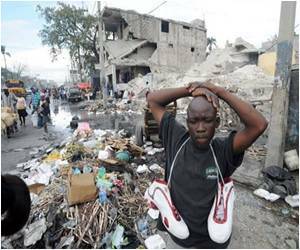 Most of the tens of thousands of people who fled Port-au-Prince after the quake have since returned to the overcrowded capital, desperate for work and food in a country still lacking another effective pole to attract labor. "You have a vision of where the government wants to go, and that?s just critical," he told AFP. "Second you?ve got leadership to take that vision and communicate it to people and inspire people and third you have political will to implement the vision." A new tool can assist experts in predicting locations which are at high seismic risk, a recent research has revealed. Chemical changes in groundwater occurring as a result of an imminent earthquake could be the reason for the bizarre behaviour of animals during such calamities, suggests a new study. Chinese scientists have said that the migration of toads or unusual cloud formations cannot be the true indicators of earthquakes.